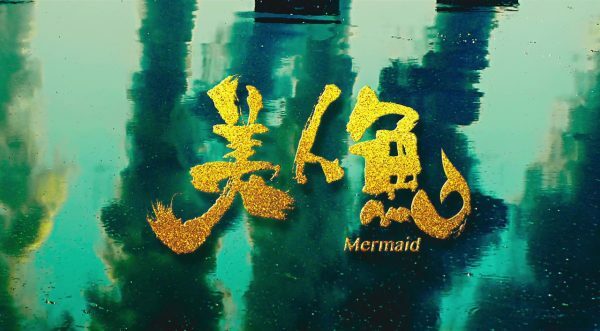 The Mermaid feels like a first draft of a love story that everything else was stapled around. Some of the side scenes are amazingly awesome, while others fall short and seem weird. Overall there just isn’t enough in the rest of the film to seem like a filling meal. Chow obviously saw the Dolphin Cove documentary as we even get actual footage of the dolphins being slaughtered multiple times throughout the film, and the imagery is used again when the humans attack the mermaid hideout. The US military’s sonar that kills sea life is also mentioned, though here it is sonar developed by a company that causes fish to explode and damages the mermaids, leading to their hiding out in a cove. Tossing this stuff into a comedy is a brave move, and while not pleasant to see, helps put actual stakes on the table both within the film and in real life. Some people might think twice about where the food they eat comes from. I Love Hong Kong is another Shaw/TVB backed Lunar New Year comedy coming on the heals of 2010’s 72 Tenants of Prosperity. It is also deeply tied to Hong Kong nostalgia, and growing up in Hong Kong. Thus, a lot of the charm of the film does not translate well to overseas markets. And while parts of the film are funny and interesting, it feels like you are at your roommate’s family reunion. This isn’t to say that I Love Hong Kong is a bad film, but if you didn’t spend time living in Hong Kong, it is probably impossible to fully appreciate it. And I say that as someone who’s never lived in Hong Kong. During the Lunar New Year in Hong Kong, it has become tradition for the studios to release comedy films. And that tradition dates back to 1937’s Bloom and Prosper, a film that doesn’t exist any more. Lunar New Year’s films generally have huge casts bursting to the brims with everyone famous they can cram in, wacky plots, romance, and lampooning cultural targets. And while the modern age may have lessened the impact of the box office, the tradition is alive and well. Besides starring a whole host of people, I Love Hong Kong has two directors, three script writers (Chung Shu-Kai, Heiward Mak Hei-Yan, Wong Yeung-Tat), and is based on an original story by 8 people (Eric Tsang, Chung Shu Kai, Heiward Mak, Wong Yeung Tat, Manho Mok, Chan Cheuk Wah, Ming Wong, and Louis Ng)! That’s almost as many people as who write the average terrible Hollywood blockbuster. Some of the cameos include Tenky Tin Kai-Man, Michelle Lo Mik-Suet, and even Maggie Cheung! The theme song repeats the “I Love Hong Kong” phrase a lot, and by the end of the song you are reassured that everyone on the planet loves Hong Kong. So get with the program! There are several other songs in the films, usually during flashback sequences, and they are classic songs well enough known that my wife was singing along. Ng Shun (Tony Leung Ka-Fai) – The former owner of a toy factory out of work when the factory is forced to close. Moves his whole family (illegally) into his father’s apartment, where he grew up, and reconnects with the residents he left behind. played by Bosco Wong in flashbacks. Shun So (Sandra Ng Kwun-Yu) – Forced to take an old job at a beautician’s office, but is treated like crap by her former coworker and friend. In another hilarious scene, she acts as a stunt double for a tv series. Her youngest daughter is Ng King (Chan Wing Lam). Sandra Ng is also in Mr. and Mrs. Incredible, The Eight Hilarious Gods, and Beauty on Duty. Ng Tung (Stanley Fung Sui-Fan) – Shun’s dad and grandfather to the three kids. Lives in the Hong Kong apartment complex all his life, and now has to deal with his grown son returning with his whole family. Is fully integrated in the complex and never wants to leave. Also his birthday is July 14th, and that’s the day I finished writing this review. Coincidence?? I think not!!!! Stanley Fung has been in over 100 films, so odds are you’ve seen him in something. Ng Ming (Aarif Lee Chi-Ting) – The son of the Ng family. Is FEHD (Food and Environmental Hygiene Department), but his job is going after street vendors, which is bad because where he just moved into is filled with the people he’ll be busting! Aarif Lee is one of the new Hong Kong heartthrob guys you will probably hear a lot of soon. They even reference one of his earlier roles as Bruce Lee in this film. Ng Chee (Mag Lam Yan-Tung) – The Ng’s older daughter, who works as a promotions model while going to college. Is shy and not wanting to bare her body like the famous E Cup Baby. Mag Lam won the reality show The Voice 2 and was quickly snatched up to a four year deal by EEG. This is her first film. Tok Shui Lung (Eric Tsang Chi-Wai) – After some rough goings when he first comes back, Tok Shui Ling and Ng Shun return to being best of buds. Tok knows a lot about everything and is good at getting Shun to go along with his schemes to get into trouble. But there is more to Tok Shui Lung than we, and Ng Shun, know. Tok is played by Wong Cho-lam in flashbacks, where we watch as his girlfriend becomes Miss Hong Kong and dumps him. Eric Tsang is also on TarsTarkas.NET in Kung Fu Cyborg and Task Force. Gong Fu (hereafter Kung Fu Hustle), is a perfect representation of human nature, complete with characters representing the ego, the super-ego, and the id. The setting and characters are mired in the secret world of Jiang Hu. Characters grow and evolve through the film, throwing off their layers of subterfuge and revealing their true selves. As the opening credits of Kung Fu Hustle play, a butterfly flutters through a canyon that is a winding, twisting maze. A pullback reveals the canyon forms the characters of the title of the film, Gong Fu/Kung Fu Hustle. The butterfly’s presence foreshadows the final act, subconsciously readying the viewers for the change they will see. The canyon walls becoming the title let the viewers know that everything we need to see is there, we just have to look in the proper way. Kung Fu Hustle is a martial arts comedy. At time the action becomes deliberately cartoony and over the top, those instances serving both comedic elements and further exaggerating the underlying role of the nature of humanity. Kung Fu Hustle‘s cartoonishness comes partially from it being among the last of the mo lei tau films, Stephen Chow growing as an artist and expanding his films’ reach to use things beyond sheer ridiculousness to get points across. Sing (Stephen Chow Sing-Chi) – Sing is the protaganist who goes through a standard protaganist’s journey. He begins down on his luck and with major obstacles in life, only to overcome the odds and save the day as the Chosen One. Sing’s Friend (Lam Tze-Chung) – Sing has a sidekick who follows him on his schemes. His friend is another good hearted person who can’t seem to do anything evil despite his numerous attempts. Landlady (Yuen Qiu) – Owner of the Pig Sty Alley complex and secret martial arts master living undercover trying to escape his past. Landlady refers to herself as “The Little Dragon Maiden” in Cantonese, a character from Jin Yong’s Condor Trilogy of books. Landlord (Yuen Wah) – Owner of the Pig Sty Alley complex and secret martial arts master living undercover trying to escape his past. Landlord refers to himself as “Yang Guo” in Cantonese, a character from Jin Yong’s Condor Trilogy of books. Axe Gang (Danny Chan Kwok-Kwan, Tenky Tin Kai-Man, Lam Suet, and numerous others) – The Axe Gang controls the underworld of the city. They dress almost as sharp as the blades of their axes. 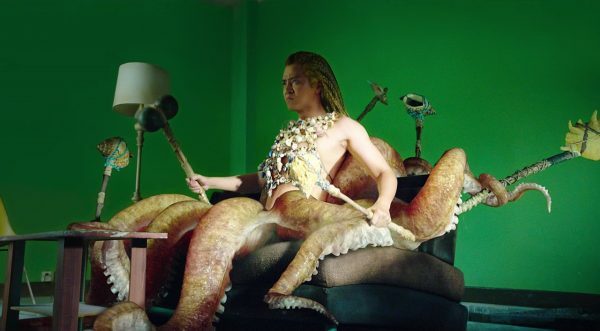 The Beast (Bruce Leung Siu-Lung) – The Beast takes his Chinese name – Dark God of the Fire Clouds – from books written by pulp novelist Liu Can Yang.